I wanted to try out the Kunz scraper for myself, to see if it lived up to recognized standards always attributed to German engineering standards and thoughtfulness of design. I was surprised and disappointed once again. Whereas the overall tool is made well enough, it’s the minor detail that makes the major difference. we have seen this increasingly common flaw throughout the bigger manufacturers producing for international markets who discard the reputation of their forebears for the bottom line economy and Kunz scrapers failed to impress where for a cost of about 5 pence sterling to them they could have at least matched the cheapest maker of these scrapers. When I picked up the scraper and set it on the scales it weighed in comparably with the standard Record and Stanley counterparts and of course shape and everything else really parallels the originals. You would think that not having developed anything original or new or improved they could at least honour the originals out of general respect. No. The paintwork was fine, but there is not much to applying paint commercially. Also, the setscrew for adjusting the blade bend was decent enough too. That’s all we really needed for the locking bar on the other side. Two things let the tool and the makers down. One is the use of regular pan head screws and washers instead of knurled nuts or thumbscrews. This is cheap. I can just about touch the Kunz versions and unscrew them once loosened with a screwdriver, but it is so small that even with average sized hands you cannot grip them at all with any kind of confidence. That means one day I will lose it in the shavings somewhere. The second arrogance is the fact that they send the scraper blade out with square edges to all five edges instead of bevelling the two long edges as is normal to all other makers. That means you must file or grind the edges to 45-degrees before you can sharpen it. How bad is that. A third point is that the tool comes with absolutely no instructions of any kind at all, not even general maintenance. I think this is symptomatic of large companies living off past reputations left by their forebears. So here is yet another tool that comes as an unfinished tool kit instead of a well made tool of quality. Why on earth doesn’t some responsible CEO or department head in Kunz take responsibility and provide a good quality cabinet scraper. What superior arrogance do these companies have to feel that a craftsman and women like you and me should be so disregarded as to send out products that just fly in the face of common good manners in manufacturing standards. It takes pennies to at least match the existing industry standard. Would I recommend this tool? I wish that I could have done so. I bought it with that in mind saying to myself, “If this is a good tool i will recommend it.” With Stanley and Records no longer out there and other models made by better makers being just a little more expensive, it would have been nice to see this company set a better standard. This one costs around £30 so it is not expensive but you feel a little miffed when these seemingly small details are not taken care of. An additional flaw before writing this post is the setscrews protrude past the face of the back of the body just where the thumbs sit in use. these must be filed down so as not to. On the other hand, the Veritas scraper is good value for money and compares very well with the Stanley and Record versions. I have used one of these for 12 years or more now and it works really well. You only need fingers for installation of the blade and the sole is larger than the other scrapers of this type. All in all the scraper works fine once set up. The sole came dead flat and the blade was industry standard of just over 1mm. less than that and they vibrate too much. The paintwork is smooth and comfortable but doesn’t really match my eyes. The box? Well, whatever. Being used to the older ones and to the Veritas one I know I will always be irked by the tiny setscrews. Children could handle them fine I am sure but they would lose them too long term. Imagine what kind of engineer allows those two screws to drive us nuts. Should he have the job or should he be replaced with a more responsible member of staff. Paul how does the kunz copare with a Faithful? Definitely a better tool. I sharpened this one up and it works fine once you file down the ends of the setscrews so they don’t gouge your thumbs. I missed that flaw. There are different scrapers addressed in the catalog you cite here. Whereas the #80 cabinet scraper is ground and polished out to 45 degrees, some cabinet scrapers have the plate bedded at a higher angle and benefit from the type of burnishing we use for a card scraper. Most of this is determined by the angle the blade is presented to the wood you see. the named bevel angle on that site just means, that the blades are delivered with this angles, not how you should treat them. Kunz is delivering the blades with the bevel angle the resellers orders. And even if the blade is delivered with a 90° angle, you have to establish a bevel. A word regarding the Kunz #80. I own one since years and this is a good and solid tool and worth the money. Apart from treating the blade I could use mine out of the box and I haven’t done anything to it. Yep, I have to use a screwdriver to remove or insert the blade. But I have to do that on my bench planes too, when I have to remove the cap iron. I think that is not a real issue. And keep in mind the Veritas one is about twice the price. I have bought this scraper about a year ago and have to attest to everything Mr. Sellers said. Another flaw I have found is that there are some rough edges from production that can damage your wood when scraping. But you can file them away easily. Setting it up took me about an hour (beveling the edge, filing rough edges). The sole and edges on mine were good, I have to say, but good to hear that they do indeed need to step up to the plate from elsewhere too. This very thing has been a focus for me the last few years. I work in sales for a consumer products company in the USA, the past 23 years, and have experienced exactly the same issues. Product managers are tasked to reduce cost any way they can resulting in this example with an unfinished product that the user is required to refine. Besides cost, in many cases product managers are not users of the products they develop leading to silly decisions to cut corners they should not. Big box mass merchant product buyers and competition seem to me to be the ones driving inferior quality and design to offer the cheapest price possible. Really, marketers and manufacturers should step up and charge what the product is worth to build it correctly. And we as consumers should be willing to pay a fair price for a properly designed product. Sorry for the rant, but it drives me nuts. I have heard the saying “it’s the stingy man who pays the most”. This applies to marketers, manufacturers and consumers alike. Everyone pays more in the end for poor service and products. It is the same with UK makers too. We are not immune to the disease of arrogant manufacturers and sales marketers either. The days when they assumption that they are fireproof is gradually coming to a close when in fact Asian manufacturing starts to surpass the standards of UK, EU and US manufacturing someone needs to sit up and take stock and NOT send their products for manufacture in Asia but raise the bar in their own country. I give you the example of Nicholson Files being made in Mexico, Bahco sliding bevels that just will not lock. I received an apology from Bahco and they did absolutely nothing to correct the problem with their tool. I talked with Spear and Jackson and told them I had tried their handsaws and tenon saws out. The sales director said to me, “Yes, they are about the best on the market aren’t they?” I said, well they are good steel, good wood, good brass.” Yes” he went on, “Really good tools, I have been with the company for 41 years.” I said, “Then how would you feel if I said you should be ashamed to have such good materials and make such a bad job of making the saws.” He fumbled about for words and then I added. “How do you account for such bad quality?” he said, “The Taiwanese can make anything well, but they have to have a standard set for them. Our saws are all made there you know.” Anyway the conversation went downhill from there. I also own this one and it works ffin but it drives me crazy everytime I need to sharpen it. Paul, what about Kunz spokeshaves? I bought this tool about two yers ago. I remember that the first thing before taking it into use was that I needed to bevel the blade at 45 degree. And of cource, sharpen it, too. The second thing was that after using it for a while the blade tilted a bit leaving a long scratch into the wood I was scraping. I thought I left the screws too loose and tried to tighten them but that was not the case. After a while (and few more scratches) I found out that the recess where the blade sits was too deep and the bar was not pressing it firmly enough to hold the blade in place. No matter how tight the screws were. A little piece of sandpaper between the sole and the blade fixed that. After these modifications I have been happy with it. Not these days Robin. Afraid they’ve gone up. US sellers come up but they are more expensive when shipping is added. Over double the buying price usually. I see that you are correct Paul, The last three that I have looked at on ebay were £28 – £34 plus £2.95 – £3.50 postage. However perhaps prices may be affected by proximity to Xmas? Strange that Robin, I couldn’t find it or any. All the Records and Stanleys I saw were up for auction. I’d appreciate a link if you have one as I’m in the market for one at that price. It’s either that or the Veritas for 40 odd shekels. Quality is inversely proportional to the number of MBA’s at a company. They are penny pinching bureaucrats who can’t spell the words, Customer, Service, Employee or Quality. This raises a question I have about cabinet scrapers. Why do cabinet scrapers need to be filed to a 45 degree bevel before turning the burr whereas the card scrapers are filed square? I always thought they were the same from a cutting perspective, but the body of the cabinet scraper made them easier to use over larger surfaces and without burning your hands. Also, I appreciate your mission to hold makers to a high standard of quality and usability. It’s really the new woodworkers (like me) that lose out when they can’t get a tool to work well and don’t understand the tuning and tweaking required to make it work beyond a simple sharpening. Exactly Brett. That is why i think Kunz supplied just sqare scraper. Paul’s comment about 45 degree bevel is somethink new to me. Paul could you please clarify this a bit? Will do, can extract it from my new book shortly. Not hard but worth a blog I think. Leave it with me. I can extract this from my new book. 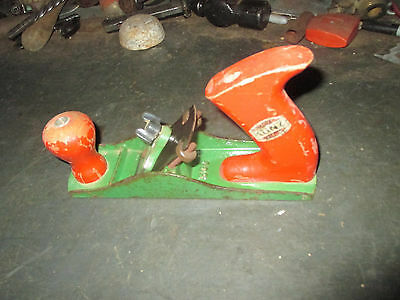 I also ended up with a Kunz scraper after seeing how much Stanleys go for in the U.S.. I got mine for 13 dollars US, shipped. In the U.S. they can still be gotten cheap, they’re just not as common. Mine is an older model: I can tell because the blade says that it was made in WEST Germany. It belonged to a woodworker, and it looks like he never used it (he must’ve owned a Stanley too…). The sole was a little bellied front to back, so I flattened it. Also I prefer a highly polished sole. Once I began using it, I just couldn’t get it to take a nice, full shaving (like you do in the Coffee Table episode 14″) and NOT chatter. Skewing helped only a little. Then the weirdest thing. I put a few streaks of paraffin wax to lube the sole (I prefer wax over oil), and the chattering went away. And not just a little bit, but completely went away. I’ve noticed in your videos that you never use oil on scraper soles. I can’t explain why mines reacted that way. I’m also making my own wooden cabinet scraper. I’m following the plan in “How to Make Woodwork Tools” by Charles H. Hayward. I put it on hold once I bought my Kunz scraper, but I think I’m going to finish it now. Paul: do you know what size screws are used on the bar? My local ACE hardware has metric thumbscrews, but the size-checker they have in-store was inconclusive. I’m tempted to drill out and tap for common #10 or 1/4″ thumbscrews. Please don’t blame the engineer for the cheap screws. Likely he or she wanted to use better hardware, but lost out to the force of some MBA in finance or purchasing. The factory producing Kunz and ECE tools has always been in former East Germany. Some companies in former East Germany made the transition quality-wise since reunification and produce world class products. Some haven’t changed much from their old habits of striving for mediocrity during the Soviet era. Please don’t throw all German products into the same barrel. Yes, no intention to cause issues there, just to bring up the point that could be clearly rectified and a good recommendation could have been theirs. Hi Paul. Some followers on here might welcome your view of using a Kunz blade in an old Stanley or Record. I ended up with two cabinet scrapers, a Record and a Stanley, neither of which had a functioning blade. I fitted a Faithful blade to the Stanley (it worked OK for me) and sold that on. The Record has a piece of Tyzack saw blade in it now, and it works. However, it is not as thick (or, I suspect, as stiff) as an original blade. Would the Kunz blade fit OK, is it similar thickness? Thanks for all your tool research – it is highly valued. It’s funny you should say that because I did some tests on same today and will be posting a follow up post on my findings shortly. Thanks for the nudge. My problem with German engineering has always been their obsession with precision even where it doesn’t count, while completely ignoring the end/ field user, making service and adjustments unnecessarily difficult. The Rikon bandsaw is a good example. Apropos another thread in the above conversation, I think this began back in the sixties, when corporations began coming to the philosophy that the point of being in business is to make a profit rather than a product. My hope is that this could be turned around somewhere along the line. If you think about it, Kunz should realise that they are the only maker of European scrapers in the whole of the EU. If they invest 15 pence in the improvement they would corner the European market. It would be a no brainer for me if I were in the business of making tools. Hard to imagine any company missing so good an opportunity. Who are they anyway, Kunz? Are they a minority player still? What does it take for a CEO or engineer with responsibility to walk down from an office, talk to a buyer and say order 5,000 of these, these and these and then walk to the factory foreman and say drill larger holes, tap them to receive these, and then walk back up to the office and see about adding 15 pence to the price of the product. It is often that the engineer did a good job and the product would be just fine if it would be built this way. But then the management reviewed the product and do some “improvements” to cheapen the product about 2cents. Then the customer complains about it and sometimes the “improvements” were withdrawn for the price of several euros plus lost reputation. What a great job the management do…. Actually, Kunz was never a representative case for German engineering. There are books published in 70-ies where authors were disappointed with Kuntz quality of manufacturing, citing pretty much the same issues. A good examples of fine German engineering in regards of woodworking hand tools would be Ulmia and then E.C. Emmerich, also Two Cherries (a brand owned by Wilh. Schmitt & Comp) and Messerschmidt tools. I sent a query to a tool manufacturer once and received a reply along the lines, “Sorry, we make but don’t don’t use our tools, so we cannot answer your question.” This is a large company name you would recognize. Many of these companies I am afraid have no idea what they are making, what matters, what doesn’t. As for small boutique tool makers, I’ve picked up hand made saws that were beautiful, but the toolmaker didn’t know how to sharpen it (based on me trying some test cuts and comparing with saws I’ve used that Paul sharpened). So, going with a small business, even one that cares about what is being made, doesn’t guarantee anything either. I’ve concluded that the situation “is what it is” and if I want to do good work, I must take responsibility for learning to convert these “tool kits” and old second hand tools into functioning tools as well as keeping my tools tuned up. I wish there were a way to make a network of craftsman so that a person learning about a new tool could try one that was set up properly and learn how it should look, feel, and sound. Then they’d be able to go home and practice until their tool felt the same. You might say, just be attentive to your work and figure it out, and I’d partly agree, but if you don’t know what is realistic for the tool, you may try for too much perfection and waste a lot of time and suffer a lot of frustration, maybe even give up, even though you really had things perfectly fine. Dmytro – wee bit of a typo there… I believe it’s Kunz although it sounds like your name could adorn their ‘quality tools’ with more accuracy. I fixed it. Thanks Mike. I’ve read your post with interest. I’ve bought my Kunz #80 a few years ago and I’m satisfied with it. But as I’m from Germany and I like to support local companies I had the idea to ask Kunz about the questions you asked. I received the answers from the CEO of the company today. Here they are in my words. 1) No manual – It would be beyond the possibilities of the company to manage the effort having manuals for every country and in every language. Their tools are provided by specialist stockist which should be able to answer your questions. 2) Thumbscrews – They will check the options of using thumbscrews. They were glad about this suggestion. 3) Blade bevel – As far as I understand this is optional and depends on the stockist who ordered the tool. If the stockist would like to have a beveled blade he can have it. It’s just a matter of price. Hope that clarifies things a little bit. It does. Thanks Stephan. I no longer have time to contact companies myself but blogging on issues has made changes in places that never would. This is great. Great post, this is another reason why 95% of my Hand Tools are old vintage. I worked for Corporate America for all most 40 years and I know what you all mean about the younger MBA’s that come into a a Company. I am a college Graduate myself, oldschool if you will. Nothing beats experience and that is a lot of the problems in today’s world and a lot of them are trying to impress their Boss’s with “cheaping” things and what a marvelous idea of out sourcing “NOT”. OK sorry I won’t get into a rant rave but miss the good ole day’s where quality was #1. HI! Paul, Happy New Year! Not to beat a dead horse, but I received a Kunz 80 for Christmas. I was pleased to find that the blade had one side beveled to 45 degrees. That was the only good thing I could find. The sole was very roughly ground and does indeed mar the surface. This will require some work. The blade falls through its slot with the clamping bar screwed down tightly. There is a 1/16 inch gap. I understand that I can file the two mating areas under the bar clamp to fix this. I also found that the adjustment screw hits the bar clamp on the bottom edge of the bar. with 1/3 the diameter of the screw. The clamping bar is quite robust and wide, and I was wondering if I filed the bottom edge of the bar, so the screw clears it would allow the scraper to function. I am also wondering how much clearance is necessary? I hope you can shed some light on this. Thanks for being such a mentor. Best wishes to you and yours. Thanks Dennis. I will copy and paste this to a blog to bring others up to date. Mine was in pretty good condition all around. Kunz should have checked this escapee. I cannot imagine a company risking its reputation with such shoddiness, but all we can do is let the world know what to expect and wait for a new company to take up the slack and give us a standard that works. Can you tell me which country you are in. I will answer your questions there so others will know what to do too. I have bought this scraper a few weeks ago (just after reading this article). Well, I have to agree with Dennis that the blade falls through the slot even with the bar screwed tightly. Shame, because this makes it simply impossible to firmly attach the blade. My first thought was to use the screw on the other side to stop the blade from wobbling, but of course that caused the blade to camber to much and made huge disaster to the wood surface after I tried some planing. So instead of filing the bar or body of the plane I just attached some metal bar to the Kunz bar and that allowed me to fix the blade soundly. BTW my blade had only square edges so I was forced to make 45 (I hope) bevel. I’m from Poland if it matters, and bought it from local store. Kunz already has bad reputation, so it looks like they don’t care. Thank you for going to the trouble in support of Dennis’s criteria. I think this will help others in their choice for a lifetime tool. Thanks Paul for a quick reply. I am a 66 year old retired in Minesota, US. I believe my son purchased this from Gramercy tools for working wood in New York. I also received a pair of their holdfasts which are terrific. If I were to purchase an 80, I would definately go used Stanley at a flea market or eBay. I think that would be cheaper and less prep work. Again thanks for all you do for us. I’m afraid we’ve sent the Stanleys and Records up in secondhand prices these days Two years ago I was buying them between £7 and £10 and then after a couple of blogs they starting steadily rising week by week. Now they are £30 plus and up to £50. Well Joel’s a good guy. he’ll replace it quickly if you let him know. Oh, and his bench holdfasts are indeed the best of the best. Why bother with Kunz, I bought a new Stanley 80 off Amazon.co.uk just a couple of years ago for ~£22 – cheaper than many used ones on ebay now and at the time. The blade was rather short but I have been very happy with it, it use it often. It is one of my favourite tools. Good for you but you can’t do that today, which is what matters, Tone. Yes, I see that it is still listed but not currently available. Pity. It was in fact almost 4 years ago! Time flies. Did they stop production sometime between 2013-2017 – you’d think having made it that far they could continue production indefinitely (there seems to be plenty of demand) – or was I just fortunate to get one of a few last NOS (New Old Stock)? Or perhaps the seller is just out of stock currently. I know it seems boasting but since my blogging on real woodworking we are finding more and more converting to hand work nd indeed real woodworking. Such tools could see a resurgence, but you know, the Veritas version is reasonably priced at £51 inc vat. BTW I picked up some thumb screws on ebay – perhaps that might be an option for the Kunz: fit your own thumb screws. Mine are Imperial diameter/thread but I think metric are available.